Settings: MakerBot Replicator 2 with our custom knot-slicing profile. 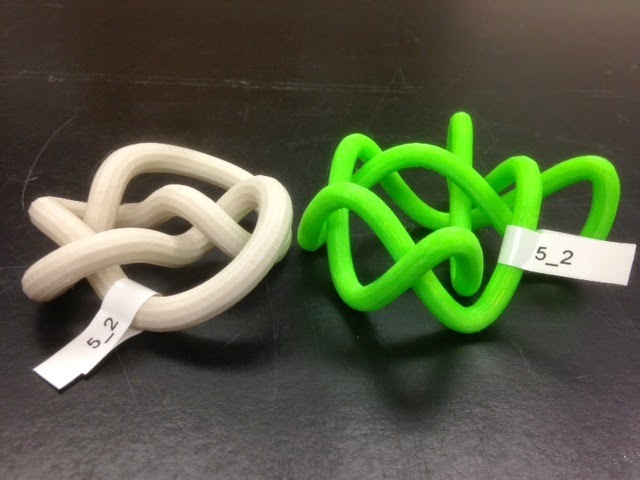 Technical notes, math flavor: Lissajous knots are knots that can be parametrized by a triple of simple cosine functions, and are a subclass of Fourier knots. Although every knot can be expressed as a Fourier-(1,1,k) knot, not every knot is a Lissajous knot, that is, a Fourier-(1,1,1) knot. In this notation the (1,1,k) denotes how many cosine terms the parametrization has in each coordinate; for example, a Lissajous knot is (1,1,1) so has just one cosine function in each coordinate, but our trefoil from Day 151 is Fourier-(1,1,2) because its z-coordinate parametrization is a sum of two cosine functions. Today's 5_2 knot is the first knot in the standard table that can be expressed as a Lissajous knot, with just one cosine function in each coordinate.